The BMW X5 M is the range-topping model and therefore, it is the most luxurious in the lineup. 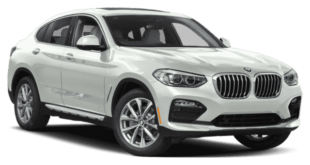 Equipped with a strong V-8 turbo engine, the X5 is a perfect combination of a sports-car performance and the SUV capability. 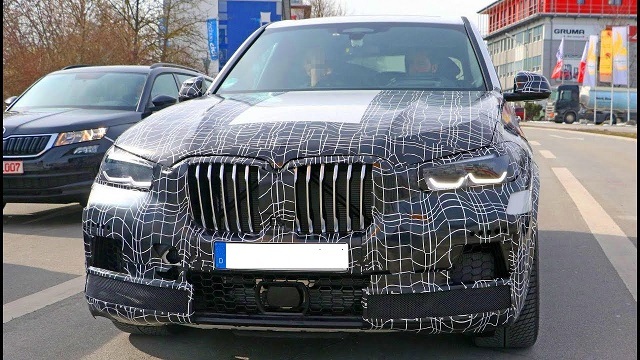 The German manufacturer is currently testing the newest version of this model which will enter the market as the 2020 BMW X5 M. The newest X5 M will come with many upgrades starting from the new platform which will make it more fun to drive and lighter. As well, it is a bit larger compared to the current model. Moreover, it will be slightly revised with larger wheels, new exhaust outlets, and a lowered suspension. 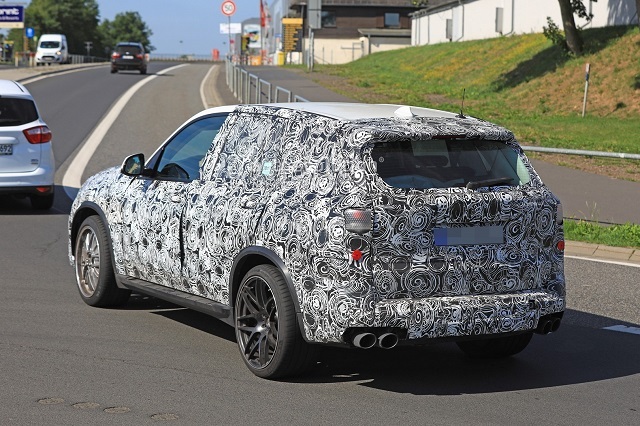 The brand new 2020 BMW X5 M will be powered by the same unit found in the current model. However, it will most likely get the latest version of this engine which should provide more power. It is the well-known 4.4-liter V-8 twin-turbocharged engine which in the current model is able to deliver 567 horses and 553 pound-feet of torque. However, the 2020 version should be able to generate around 600 horsepower. This unit is linked to an 8-speed automatic transmission. The all-wheel drive system, called the xDrive is standard as well. It also features an engine start/stop system for improved fuel economy. It is rated at 14 mpg in the city, 19 mpg on the highway, and 16 mpg combined. The current X5 is underpinned with a platform which dates to 2007. 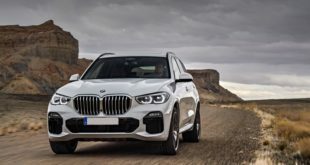 However, the newest 2020 BMW X5 M will be based on the new modular architecture, and it is the SUV version of the BMW’s CLAR platform. It is the same one which is used in the 2016 7-Series model. So, the 2020 model year will not only be lighter but also better sculpted and more fun to drive. As well, it will be slightly larger than its predecessor. It is now 1.4 inches longer, 2.6 inches wider, and 0.7 inches taller. 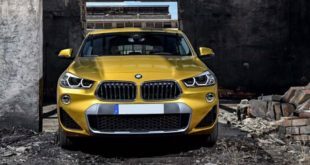 As for the external appearance, the 2020 BMW X5 M has been spotted several times wearing camouflage but we could notice some changes compared to its forerunner. So, the new BMW will now get larger alloy wheels, M graphics, and a lowered sports suspension. As well, instead of the familiar quad exhaust pipes, the X5 M will feature two rectangular outlets. The front end will receive the well-known kidney grille and a revised bumper. The standard seating configuration of the 2020 BMW X5 M won’t change. It comes standard with two rows of seats and it is able to accommodate up to five passengers. However, for those who need more space, the standard X5 offers the third row as an option. The X5 M is the range-topping version in the lineup and it offers more luxury. The seats are upholstered in quality Merino leather. 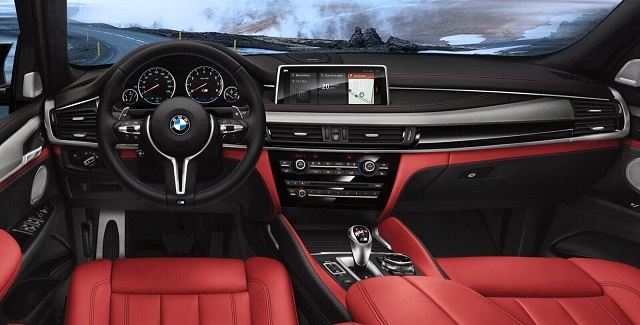 The dashboard is also wrapped in leather and features special M badging and red accents. There is also a large 10.2-inch touchscreen for the infotainment system. All the seats are very comfortable, power adjustable, and supportive and the rear ones can be folded in a 40/20/40 split. Behind the second row, there is a cargo room of 35.8 cubic feet. 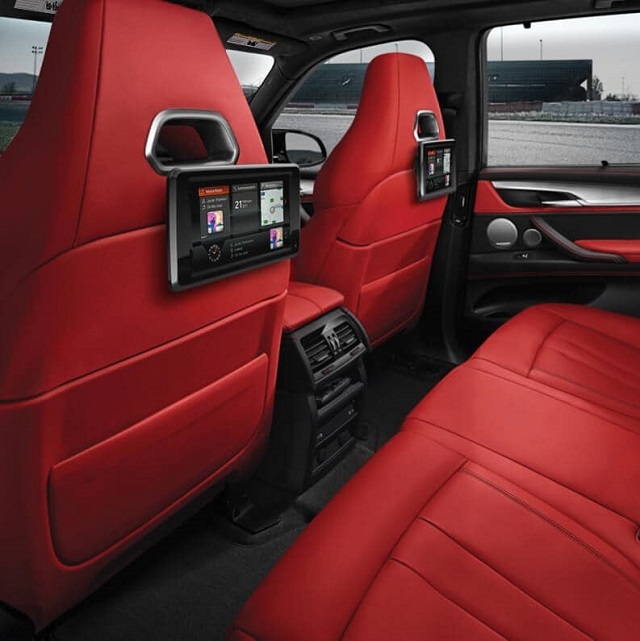 However, with the rear seats folded down, the BMW X5 M offers the room of even 76.7 cubic feet. The 2020 BMW X5 M is the range-topping model and features plenty of standard features. So, it comes standard with quality leather upholstery, a power tailgate, panoramic moonroof, 4-zone climate control, 18-way power adjustable front seats with three-stage heating, universal garage remote, parking sensors. On the center of the dashboard, there is a large 10.2-inch touchscreen for infotainment system with navigation and a Harman Kardon AM/FM/CD HD Radio audio system with 16 speakers. Furthermore, the X5 M will also be offered with one package which will include many features. It adds a heated steering wheel, heated rear seats, ventilated front seats, a surround-view camera, head-up display, soft-close automatic doors, in-car Wi-Fi and wireless phone charging. This package will also include a lane-departure warning, automatic emergency braking, and frontal-collision warning. Blind-spot monitoring, Apple CarPlay connectivity, night-vision assist, great Bang & Olufsen audio system, and a rear-seat entertainment system will also be available. As for the safety, all the models come with a rearview camera, while a head-up display, automatic emergency braking, adaptive cruise control, active lane control, and a surround-view camera system will be optional. 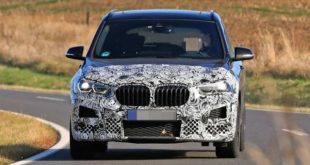 The all-new 2020 BMW X5 M is expected to arrive sometime during next year. The price is not yet known, however, it could be slightly increased this time. The current model starts at around $102,700 while fully equipped, it costs almost $120,000.